Inspired Honey Bee: 30 Before April 30 Project 14 Completed! 30 Before April 30 Project 14 Completed! The Blogger dashboard is dangerous - a "quick check" can turn into hours of searching, a longer list of projects and more blogs to follow (it's a vicious cycle). Every once in a while I stumble across a great idea and I can't stop myself from giving it a chance to blossom in my craft room. 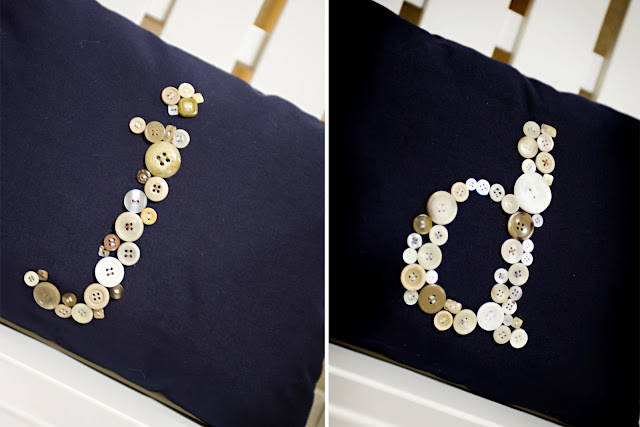 Letter Perfect Designs is a creative artist and you can find her amazing button monogrammed pillows on Etsy. Well, you can now find my amazing monogrammed pillows on the couch! But before I continue bragging, let me explain how it's done. Materials: one half yard sturdy fabric, lots of buttons, hot glue, sewing machine, needle, thread. Start by cutting four rectangles or squares in the desired pillow size. Print letters that you like and cut them out to make a simple template. To make this easier, I actually hot glued the buttons on the pillow. Note: do not glue the button holes. To make this look really good, I stitched each button to the fabric and used leftover thread that comes with all of my sweaters. Go green! I'm not going to bore you with the details of sewing a simple pillow, but if you're really chomping at the bit to learn how, click here (hit it Martha). 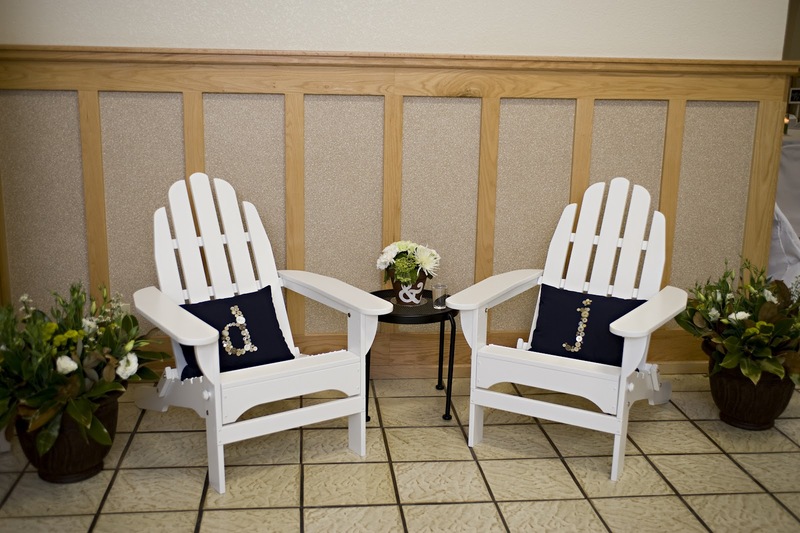 We ordered bright white Adirondack chairs for the house but have decided to use them at the wedding. These pillows sat on chairs welcoming our wedding guests. Pretty cute, huh?! Wow really like the button monogram too! !